We had a wonderful stay at Coconut Villas! Ali’s condo was perfect! Very spacious and clean. The pool at the villa was fantastic and the beach was a short walk across the street! Everything you could ask for in a fabulous vacation. Very clean, good for the price. Staff and amenities were not so great. Easy access to beach and walking distance to great restaurants and cafe. Kayla is fantastic and makes you feel welcome and at home. Room was cozy, pool was clean and warm enough to swim in February. Had a great stay! Are you trying to find the difference between a resort and a villa? If you haven't stayed in one of our villas before, then you are missing out on the ultimate peaceful retreat in Redington Shores. You could have a pool, lawn, kitchen, bar, and lounge area all to yourself, rather than sharing a public resort area with all the other visitors. Expedia's here to help you have the best holiday, so go ahead, kick back and live like a royal. 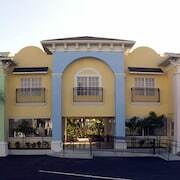 When you stay at one of our majestic Redington Shores villas, you can let all those troubles of lodging at a hotel melt away as you enjoy the privacy of your own villa. Whether it's eating breakfast for dinner to skinny-dipping at midnight, it's your house, so you make up the rules. And yes, we know you still need your space from time to time. Which is why our villas are so much bigger than your typical run-of-the-mill hotel suite. Renting a Redington Shores villa can be a great substitute to booking a hotel when you are travelling to Redington Shores as a family or with a group of friends. You'll undoubtedly cherish the experience of immersing yourself in the local community and culture. If you'd rather take a secluded trip instead of staying at a tourist resort, Expedia can make your serene escape happen quicker than you think. If you're intrigued by the idea of a villa rental but are a bit frightened by the process, stick with Expedia, and we will help you make your plans as easy as possible. After you experience all the charm and the benefits of spending your holiday in a private luxurious villa, you won't want to go back to the traditional resort. 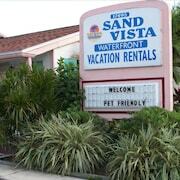 Where you stay in Redington Shores is all based on your personal needs for your holiday. It can serve as a home away from home...or, if you want privacy, you can choose to be in an exquisite holiday villa. Forget about resorts blaring music at all hours of the night—the party is over when you go to bed. Not familiar with the area? Don't worry; some of our villa rentals have concierge services available if you need someone to help pick the perfect activities and restaurants while you're in Redington Shores. So, when you're ready, Expedia is here to help you book your marvellous villa holiday.